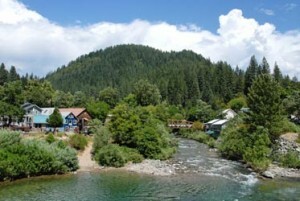 Downieville is a quaint goldrush town at the confluence of the Downie and Yuba Rivers. Pretty well maintained from its beginning on the western frontier, the walkways are still wooden and you feel like Billy the Kid is bound to come crashing out of the saloon at any moment. The beautiful and famous Lake Tahoe is only an hour and a half drive from the Yuba River. Tahoe is home to Tahoe National Forest campgrounds, hiking trails like the Pacific Crest Trail, fishing, horseback riding, mountain biking…everything outdoors you could possible want on top of your whitewater rafting or kayaking trip. Although summertime flows are typically too low for kayaking or rafting, the Yuba River is very popular for it’s big swimming holes and beautiful scenery. You can hike on section 15 of the Pacific Crest Trail which is just six miles from the Yuba River. Experience sweeping views of the river canyon from the trail. Nevada City and Grass Valley are two mountain country towns that have an old west charm with an almost bohemian attitude that fosters a haven for all sorts of artists, musicians, writers, poets as well as ecologists and environmentalists. Many boutiques, cafes, and curio shops to choose from while walking through either town.